Shocking Real Murders by Agatha Christie is the latest novel to be released on the occasion of Crime queen Agatha’s 125th anniversary. The full name of new Agatha Christie book is ‘Shocking Real Murders Behind Her Classic Mysteries’. It is a must-read for all the crime-fiction fans around the world. 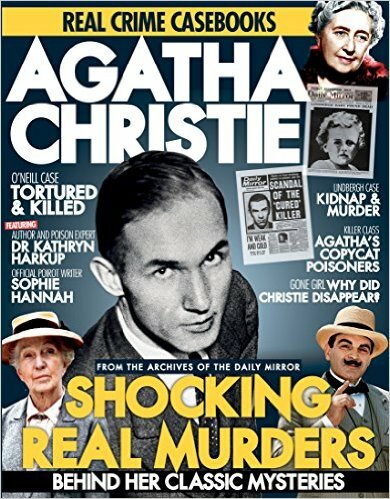 This new book, Shocking Real Murders by Agatha Christie is an extraordinary souvenir from Mirror collection which salutes the exceptional crime mysteries written by one of the greatest crime novelists of all time. Shocking Real Murders celebrates Agatha Christie’s career, her intriguing characters, and thrilling crime stories. The thing that makes this new Agatha Christie book very special is that it takes a deep look through the bestselling stories of Agatha and the real murders that inspired her to write those crime mysteries. Shocking Real Murders unravels the secrets behind the clever detectives and wicked criminals featured in Agatha’s novels and compares two of Agatha’s incredible fictional detectives. A must-have souvenir for all the Agatha Christie devotees! Agatha Christie, the queen of crime fiction, was born in 1890. She wrote 66 crime novels, 14 short stories, and six romance novels. Agatha also wrote the world’s longest-running play The Mousetrap. She created the most popular detective characters – Hercule Poirot and Miss Marple. Agatha died in 1976 in Winterbrook, England. She is regarded as the most-read crime fiction novelist and her fans still love her even after125 years after her birth.